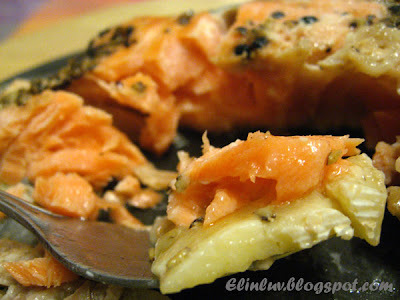 Given a choice I would choose alaskan salmon anytime :) I love salmon whether smoked or pan seared or as sashimi . 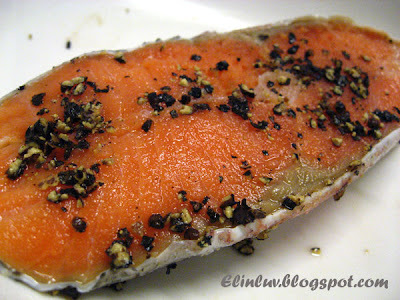 Don't know why, but I love the texture and the natural saltish taste of salmon. I love it medium cooked when pan seared, it is just wonderful when especially with just some crushed black peppercorn and a sprinkle of sea salt. Just with this two ingredients and lightly pan seared it with either olive oil or grapeseed oil...you get a world class salmon steak....beautiful taste and it explodes in your mouth with every mouthful :) Sorry , I am not over exaggerating here. For yesterday dinner, I cooked this delicious salmon fillet with just salt and black pepper and topped it with slices of brie....Mmmmm..I can't express how good it is.....just one word H.E.A.V.E.N.L.Y ! Salmon are expensive over here, but for someone who simply loves it , will not mind the price at all...like ME, I will sneak in one or two pieces each time I see fresh thick slab of salmon fillets displayed at the fish section in Jusco. Only Jusco has the best salmon in town :) I heart this style of cooking salmon. Pan seared for 2 minutes on each side and it will be just cooked. If you want it more cooked , then you have to leave it on longer on each side. hot from the pan......delish ! Rub crushed peppercorn and salt on both sides of the salmon fillets. Heat up a non stick pan with grapeseed/olive oil under medium high heat. Pan seared the salmon for 2 minutes on each side. Off the heat, top it with brie slices while the salmon is still hot. Dish out and serve with mango slices . hey, i can see it rare a bit inside.. wonder how it taste.. really a hearty meal u have, eh.. I can see that you simply adore salmon. This looks nice but I'd prefer it to be a bit cooked minus the cheese and loads of salad! Remember there's one time I go to the fish dept to get a slice of fresh salmon. Wow... it cost me about $20.00! Gosh, there're four of us lol! haha.... Yours look really tempting. Enjoy & have a great day! 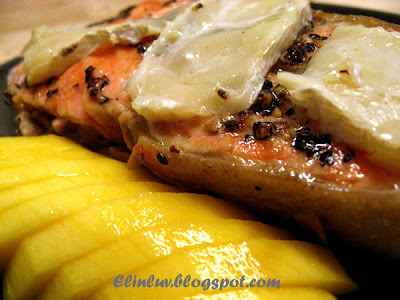 What a great looking meal, love the brie topping and mango as a side, what wonderfully delicious additions to salmon. what a wonderful salmon! simply prepared is always the best, nicely cooked and finished with that lovely brie and those delectably mangoes! I love salmon too. I can eat it whether it's cooked, rare or sashimi. 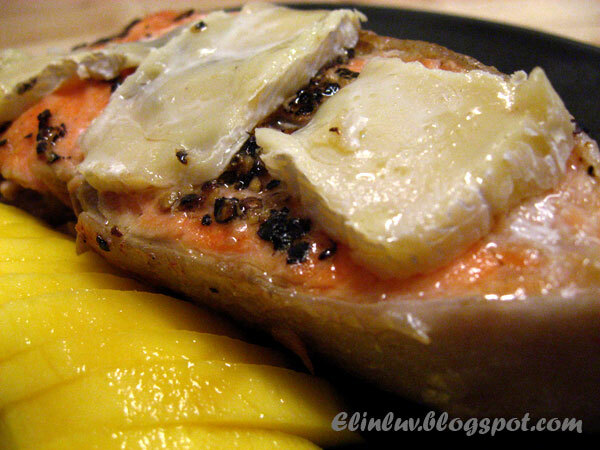 I like the way you prepared this salmon, looks so delicious. I love salmon too, that's about the only fish I buy here actually. Looks so good with the cheese! 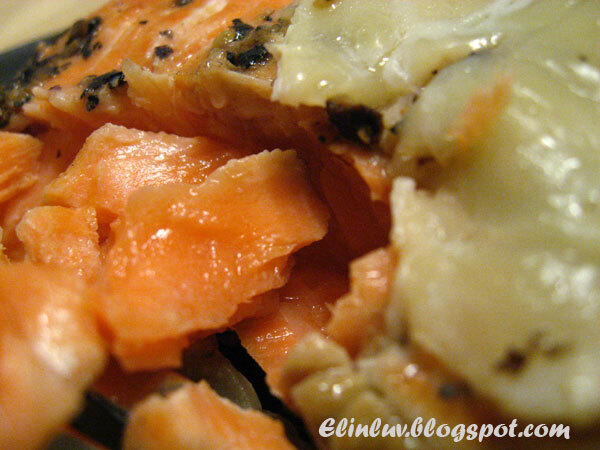 I love salmon too but have never tried it with brie. Sounds delicious! 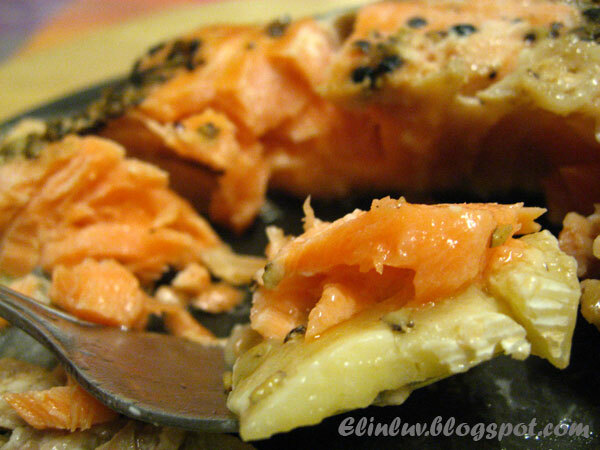 I love salmon cooked or sashimi. 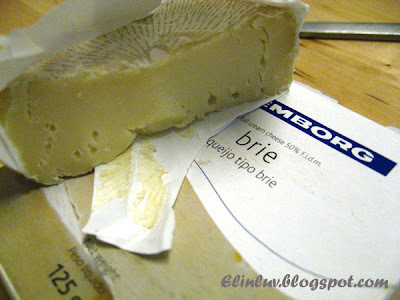 My husband will love this, he "heart" brie. Such a succulent-looking dish. Lots of fish meat goodness. Kristy....I don't understand why our food are so expensive compared to other countries :( salmon and cod are darn expenisve. Jo is enjoying all the cods she can over in UK. You too , have a great weekend :) Nope for once, he ate it with bread and soup....haha training him to go without rice !!! 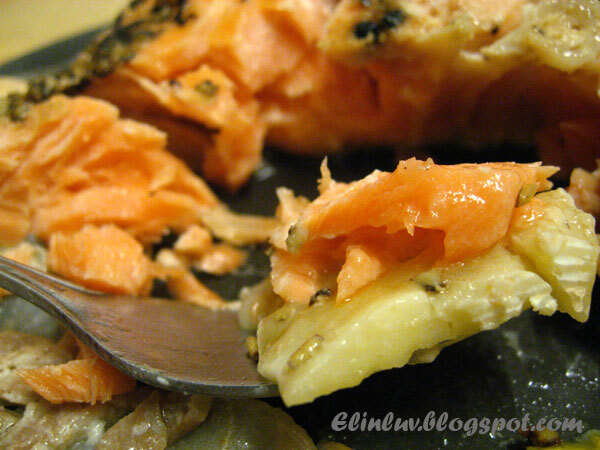 Elin, salmon is my favourite too. That does sound and look a heavenly treat! That looks fantastic! I could eat salmon for breakfast lunch and dinner! In fact, just had smoked sashimi last night! You're absolutely right, it is supposed to be cooked so still "raw" in the middle. Otherwise it looses all of it's nutrients! That really stinks that it's pricy were you live. I agree, I would pay whatever the asking price also. FYI, I sometimes buy canned Alaskan Salmon (with skin & bones for calcium) it is much cheaper than fresh. I use it for Salmon Croquettes, salads etc. There is nothing like a really good filet of salmon. And topped with Brie? Wow!